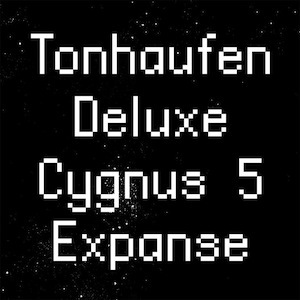 Tonhaufen Deluxe is a multifaceted European quintet, formed in 2011, which took its time to mature compositions and influences before releasing their debut album, Cygnus Five Expanse. Founded by tenor saxophonist Sebastian Von Keler, its main composer, the band also features Simon Girard on trombone, Florian Mobes on guitar, Andrey Tatarinets on double bass, and Frederik Heisler on drums. The docile “Run” opens the record by lumping together gorgeous electro-acoustic guitar sounds, mellow rhythmic engagement, and immersive melodies. Far more audacious in posture is “Flurry Curry”, which presents a hearty dose of blithe indie rock reminiscent of bands like Weezer and Green Day. The music, in seven, displays a perfectly singable melody uttered by the horn section and a few rhythmic mutations that lead to a burning guitar solo wrapped in metal technique. Layered with an intriguing artistic echo, the ambiguous “A Small Step” relies on low-pitched drones, salient brushed drumming, extended jazzy chords, leisured bass walks, and horn multiple interactions with both diatonic and atonal adherence. Penned by Mobes, this is a smooth, never-rushing ritual that falls between the rudimentary and the sophisticated. The bacteria-inspired “Staphylococcus Aureus” is another shifting piece that exhibits a nuanced, classical-like melodic figure at its center. The phrase is declared alternately by saxophone, trombone, guitar, and bass, while sonic layers keep being built in crescent counterpoint. Besides solos by Girard and Keler, the piece highlights the energetic chops of Heisler, who incurs in stunning rhythmic displacements and veers his beats in favor of the surprise factor. Totally within the jazz sphere, “Nack Blarcissus” is a pun in which the band follows the harmony of Joe Henderson’s classic “Black Narcissus”, adding a bit of African spice to the rhythm. Its fresh summer breeze contrasts with the winds of punk on “59 to 1”, a composition by the San Francisco band Tuxedomoon, here fantastically propelled by a slapping stomp. The infectious rhythm made me want more, especially after hearing the saxophone flying, even for a very short period of time. Sharp unisons conclude this indelible track. Before conceptualizing brittle textures within a static reverence on Louis Andriessen’s “Eisenstein Song”, the band alchemizes gnarling rhythms and catchy riffs on “The Early Spring”. Firmly anchored in an indestructible groove of bass and drums, the song dwells in a glamorous space between jazz funk and post-rock. Genre-busting adventures nourish this music, showing the musicians’ ability to cohere tightly and offering up a solid listening.